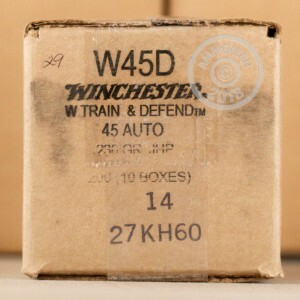 This "Defend" ammunition from Winchester's Train & Defend series offers CCW holders an approachable, shootable .45 ACP load that delivers reduced recoil without losing the ability to stop a threat. Each cartridge in this box of 20 fires a 230 grain jacketed PDX hollow point bullet engineered to expand reliably even at the relatively low muzzle velocities provided by this caliber. As part of the Train & Defend line, this ammo has the same recoil profile and external ballistics as its "Train" equivalent, which makes it possible for you to get inexpensive trigger time without sacrificing realism in your practice sessions. 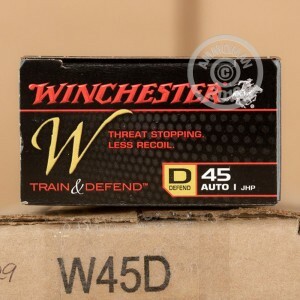 Shoot "Train" ammo and carry "Defend" ammunition for optimal performance at a reasonable cost. 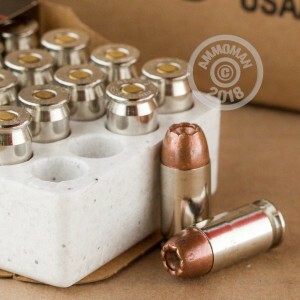 These cartridges are loaded in Oxford, Mississippi using non-corrosive Boxer primers and brass cases with nickel platings that improve their durability, as this ammo is meant to be carried often and shot little.